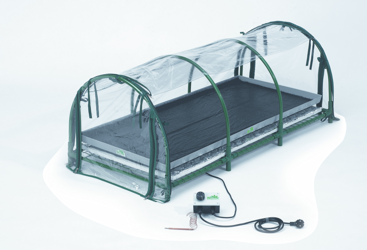 Perfect propagator for hobby to semi-professional level. Bio Green Jumbo is an amazing propagator, all packed up in a neat little box. Easily assembled, it can hold several large trays of propagation cubes and - thus - several hundred clones. 1200mm x 500mm x 500mm high. Carton size 63 x 44 x 10 cm. Includes heat mat and thermostat for accurate bottom heat. High top allows use with larger plants. Easy access through zipped sides and ends. Assembled in minutes â€“ no tools needed. THREE YEAR warranty on Heat Mat. Propagation - a warm and humid atmosphere ensures brilliant success with cuttings of many species. Plants - delicate plants and exotic tropicals will flourish in the protective environment found inside the Jumbo. Over-wintering - cherished plants can be held in a Jumbo through the cold dark months and be kept in prime condition for the following summer.